This Is a blog for the Day to Day Computer issues we face, the Super Kev is here to help. Ive been a little slack of late when it comes to blogging, had heaps of work to do and not enough time to blog, but whilst i have been working away hard i have come accross a few issues that i would like to share with you all. This one was a bit of a pain when i was recently recapturing my distribution image at school, over the school holidays i thought it would be a great time to re-image the student computers with all the latest updates for the applications i had previously installed. I fired up my previous image i had in Hyper V, so that i could install the updates and recapture it again ready for deployment, to my surprise when it turned on i was greeted with the screen shot below, i was aware that running SYSPREP would make the computer think that it was a fresh install on the first turn on, but i wasnt expecting to see the error below. so here is how to fix the error then you can boot into your image to install your updates. Step 1. When you see the error dont click on OK hold down the SHIFT key and press F10, this will open a command prompt window. Step 2. type in regedit like the image below and press the enter key. Step 3. 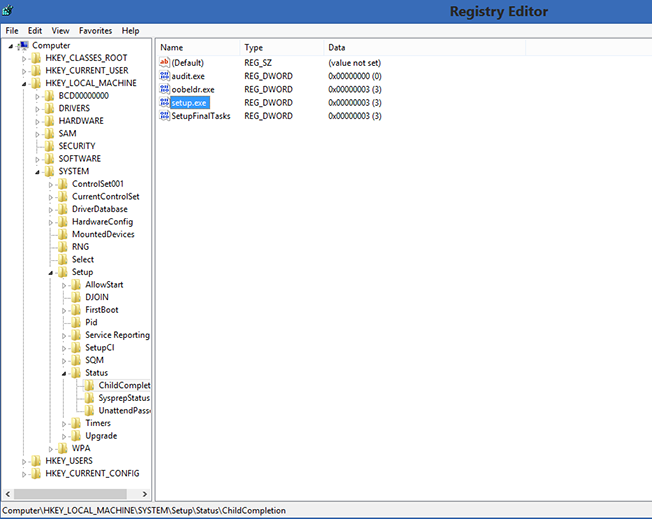 Navigate to the following registry entry HK_Local_Machine/SYSTEM/SETUP/STATUS/ChildCompletion, find the key called Setup.exe and change the value from 1 to 3, once you have done this close down regedit and then hit the OK button on the error window and the computer will reboot, it will go through the same process as before "Setup is preparing your computer for first use" but this time it will actually get you to the login screen then you can login and continue installing your updates. Windows 10 VPN using remote gateway FIX ! !